Earth, how is everything going on there? Today we decided to start a little late and sleep one more hour because yesterday everybody looked tired after the activities involved to have a home on Mars and do an excursion, so at 08:00 everybody was in the lower deck to do exercises led by Tania, she made us do real exercises! Then we ate cereals for breakfast. During the day, I met every Martian in order to know how their projects going on. Their projects have different kinds of topics like augmented reality applications, space suit simulators, communication, psychology tests, agriculture, astronomic pictures, and so on. Today, Danton and I had our EVA to create a 3D Map of the MDRS. It’s splendid the pictures and videos that you can get using a drone. Until now, this day was the most terrestrial day that we ever have since we arrived at Mars, when we realized that we were almost out of diesel, we activated our protocols of emergence turning off everything that is possible to turn it off (the power of the Greenhab of course not! ); allowing to charge the batteries using the solar panel as soon as possible. We were planning to use the energy that we got at night, moreover, we were willing to sleep in the Greenhab because is warm and we wanted to transmit our heat to the plants. We are on Mars; we have to take care of every plant that we have. Fortunately, Shannon arrived at 15:20 and saved our Martian lives with 15 gals of diesel. Every Martian worked together to accomplish the vital activity to refill the tank with diesel and we got it! There are a lot of probabilities to have a stormy day tomorrow and now we are ready for it! Days before the crew listened a woman yelling, today talking with Shannon about it and the mountain lion’s footprints that we saw in El Dorado Canyon; we can say that we are not alone in the MDRS, around us there are cougars (they yell like a woman). What a crazy day! 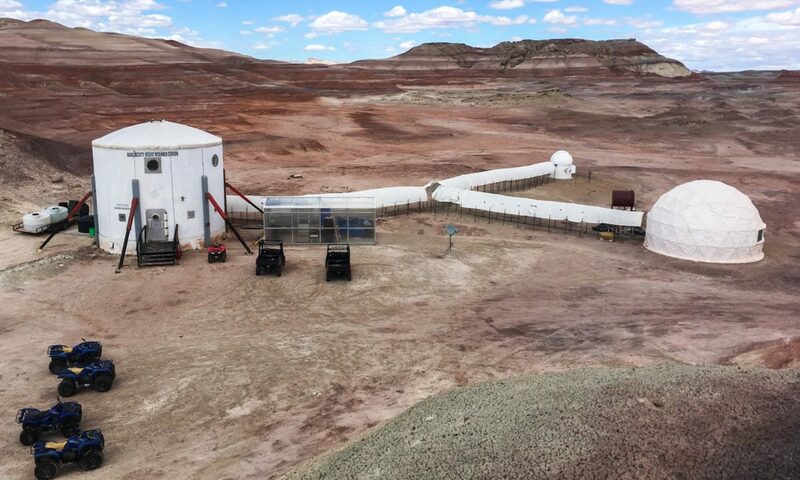 … Now every Martian is writing their reports for Capcom, then we are going to eat a dinner together and start to plan our next EVA for Sunday because, for the weather, tomorrow will be inside the Hab. We want to visit El Dorado canyon again! Tomorrow, every Martian will work on their science project. The diesel tank was almost over. We refill it with 15 gals more that Shannon brought us. Reports to be filed: Sol Summary, GreenHab Report, Operations Report, EVA Report, and Journalist Report.